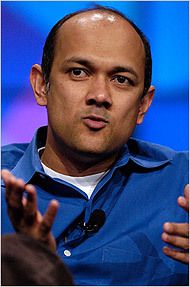 Satish Dharmaraj, the co-founder of Zimbra and an active angel investor, is leaving Yahoo, Boomtown reports. He’s not saying why — I interrupted him in a meeting when I called to ask — but in the last half a year he’s already put angel funding into simplified blogging service Posterous as well as open-source web meeting company Dimdim. He and his cofounders sold e-mail software company Zimbra to Yahoo for $350 million some 15 months ago, and he’s since helped Yahoo make its email system open to third party applications. He’s probably the sort of person Yahoo would like to keep around, but he’s also the sort of person who Silicon Valley needs focusing on angel investments — and if he’s like other former Yahoo’s, it wouldn’t be surprising for him to start or join a startup. He’s previously held leadership positions at Openwave Systems and OneBox, and worked at Sun and other companies. Cost-effective business software is something that companies might still want in a recession, and Dharmaraj is in the middle of business software innovation. With that, here’s a post he wrote for us back in 2006 about Microsoft’s struggles to move its office software online.